Worn or dirty chair casters can strain your legs and back when you scoot around. When casters roll as they should there's less strain on your body. Chair casters that roll too freely can accelerate ("skate") away from you when you get out of the chair. When you go to sit down agian, the chair won't be where you expect it and you can fall. 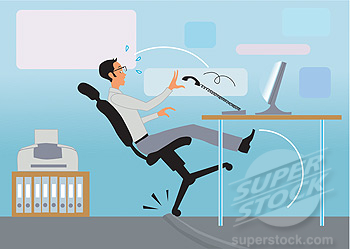 If your chair moves out of position too easily, you can become fatigued trying to keep it in place. Heavier people put extra stress on casters. Inferior grade casters can break down under the load and cause a chair to tip over. Hard casters can damage hard floors. If the floor tiles contain asbestos, this abrasion can cause asbestos particles to be released into the air. Newer floor tiles do not contain asbestos fibers, however, asbestos is common in older tiles. Better quality chair casters are rated for a minimum of 125 pounds-per-caster. Good chair casters enhance your comfort and safety. Economy-priced chair casters are typically rated to support 75 pounds-per-caster. Theoretically, a 75 pound-rating per caster should support 375 pounds on a 5-star chair base. However, during actual use full weight is not evenly distributed over all five casters (for example, when moving from a chairmat onto another surface). Cheap casters often fail, especially when used by heavier people. Just as tires must have the proper tread for safe driving performance on dry pavement as well as slick or snow-covered roadways, chair movement depends on wheels that provide appropriate traction on hard and soft floor surfaces. Use hard casters for soft floors. Use soft casters for hard floors. Hard floor surfaces (e.g., tile, wood, cement) require soft wheel casters or the chair will be subject to dangerously rapid movement. Most new chairs are equipped with hard wheel casters for use on carpeted surfaces only. Hard wheels skate and slide on hard floor surfaces, causing the chair to roll away when the user rises. When the user tries to resume a seat the chair is no longer there and the user can fall and become injured. Soft wheel casters should be used for safe rolling on chairmats and hard floor surfaces such as tile, wood, or cement. Soft-wheel casters are more resilient to protect the floor and to keep the chair from rolling too freely. Soft casters are also quieter on hard floor surfaces. Carpet casters (hard tread) are made of hard materials like metal, plastic, and hard rubber. Hard-floor casters (soft tread) are softened with urethane elastomers or polyurethane, vinyl, or soft rubber. The materials often look the same. You may not be able to tell the difference between a soft and hard caster by looking at them. You have to put your fingernail into the wheel and see if it "gives" even just a little. Then it is a soft wheel. A hard wheel has no resilience. Smaller diameter wheels suffer more stress and rolling resistance. Larger diameter wheels roll easier and more freely over dirt, grit, flooring imperfections and small fallen objects. They also roll more easily over deep-carpet pile, and may also carry more weight. Typical office chair caster diameters range from 2" to 2.5" (about 50mm to 65mm). Larger casters of 3" (75mm) diameter or more are better for deep-pile carpet, for uneven surfaces, and for those who scoot around a lot with the work area. The most common caster found on today's office chairs. Dual-wheel casters are attractive and help distribute weight over a broader surface, which protects both casters and floors from wear. Simpler in design and can sometimes roll or swivel ("caster") more easily than dual wheel designs. Casters are sometimes "hooded" with a fender or skirt (metal or plastic) covering the wheels. The hood hides dirt, hair and debris that can accumulate on a caster, but serves no other function. The neck of the caster blends in with the chair base for clean design lines. A variation of a single-wheel caster. Usually made of either hard (metal) or soft (vinyl) materials in the shape of a globe or half-globe. Some folks like the way they look and they change directions easily when you scoot around your work area. They don't work well on deep-pile carpeted surfaces. Braking and Reverse Braking Casters look just like non-braking casters. You have to load/unload them to check for braking movement. The opposite of safety-brake casters. They resist chair movement when weight is on the caster. Most often used for added safety on work stools (e.g., drafting chairs) that are higher than normal chair height. A toe-brake completely locks the caster wheels to prevent chair movement. In the unlocked position the casters roll easily. Often used for disabled people, for example, a care-giver can lock the wheels when the user gets in and out of the chair; or a teacher can lock the wheels to keep a special-needs student from "scooting around" during instructional periods. It's usually only necessary to lock 2 or 3 wheels to effectively stop a chair from moving. Dual wheels split apart for easy cleaning. Dissipates static charge build-up away from the chair and the worker. Used in surgical suites, electronic component assembly lines, and clean rooms. In addition to being made of static-dissipating materials, they often have some sort of metal connection (wire loop or chain) with the ground. Must be kept very clean to function properly. A layer of dust will negate the static-dissipating effect. Only available in soft tread for hard-floor applications. Large diameter and rubber tread glide easily over uneven surfaces, for example, on cement warehouse floors and elevator thresholds. Single-wheel design swivels easily. The chair can slide but cannot roll. A foot replaces the caster to keep the chair stationary. Used for work requiring very controlled hand manipulation or fine dexterity, for example, medical and laboratory work or playing a musical instrument. Some jobs, such as operating a sewing machine, require use of a foot or knee to operate the machine, making chairs with wheels impractical. Casters should be thoroughly cleaned periodically as a routine part of equipment maintenance. Otherwise, dust and debris build-up may cause the caster wheels to lose their mobility and performance. A regular cleaning schedule is especially important for conductive (ESD) wheels. Caster wheels and glides wear like tires and should be replaced as a set for a safe and even ride. In addition, there are often slight differences in casters made by various manufacturers, that could also cause an unsafe, uneven ride if all casters are not replaced at the same time. Casters amd glides can be easily switched in minutes using tools such as a rubber mallet, flat-head screwdriver, and pliers. Remove caster from leg of chair base. Select the correct diameter and height of stem. Most office chairs use a 3/8"D x 1"H stem. The stem top can be flat or rounded, as they're interchangeable. You can substitute a shorter stem if necessary, for example, a 3/8"D x 1"H stem can substitute for a 3/8"D. x 1-1/2"H stem, as long as the caster has no neck (see #3 below). If you want to use a Euro-style caster select the correct neck (barrel) diameter. (The neck serves no function except to make the base and caster appear to be one.) You can use a caster without a neck to replace a caster with a neck. Larger diameter casters usually have no neck. If you are substituting a 1"H stem for a 1-1/2"H stem, do not select a Euro-style caster as the neck may rub against the chair base and interfere with swiveling. Friction ring caster. The most common office chair caster stem. Simply slides into the recepticle hole on the chair base. 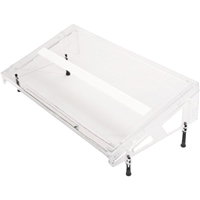 Still used on mobile furniture (e.g., rolling file pedestals, etc. ), but rarely found on today's office chairs.